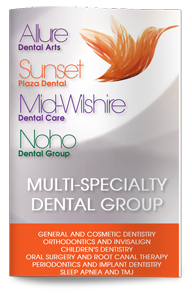 Our West Hollywood dentist is committed to providing you and your family with the information and the dental care you need to maintain a healthy, happy smile for life. With extended office hours and convenient payment options, you can be confident that you will always have access to the care you need when you need it. Good dental care is critical to maintaining the smile you want. Because your smile is the gateway to the rest of your body, the way you maintain your teeth could affect your overall health, too. We recommend taking a proactive approach to your smile needs. Our Guardian PPO dental insurance dentist in West Hollywood places a special emphasis on prevention. Good daily dental hygiene, routine cleanings and checkups and fluoride treatments or dental sealants can all work together to keep your smile looking and feeling great. Other treatments are also available. Orthodontics can be used to straighten your teeth or correct bite abnormalities, which may be associated with TMJ disorders, pain and dental disease. Invisalign is a popular option with teens and adults alike and can be used to correct virtually any orthodontic problem. We also offer tooth restoration options. Many people lose a tooth by the time they are 35. Replacing the lost tooth or teeth can help prevent future dental problems, such as tooth decay, gum disease and bone deterioration. Replacing the missing tooth can also restore the beauty and function of your smile. Our West Hollywood Guardian PPO dental insurance provider offers dental implants, which can replace one tooth or an entire mouthful of teeth, as well as dental bridges and dentures. Although the function and health of your smile are important, we do not neglect aesthetics. We offer teeth whitening, dental bonding, Lumineers and porcelain veneers. Give us a call today to learn more or to schedule your next appointment.